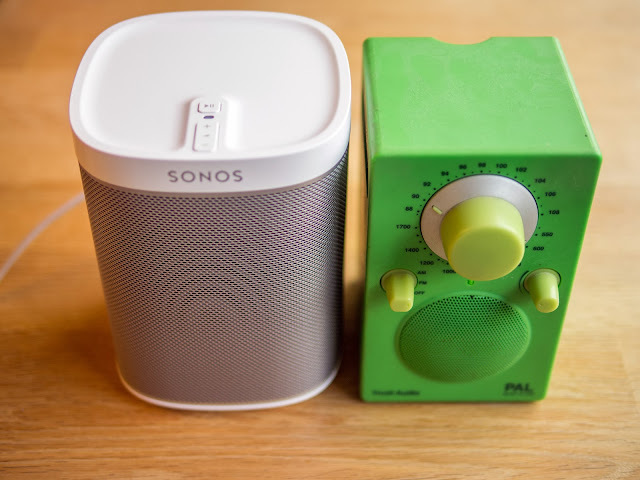 Oluv's Gadgets: Review: Sonos Play:1 - smallest yet best? I have kept an eye on Sonos for several years now. I have heard the Play:5 in a store, I had the Play:3 at home for my own testing and I was quite impressed by the Sonos system as a whole, like the ability of pairing 2 speakers into a stereosystem without any needed wires inbetween, but neither of their speakers really impressed me that much to actually feel the need of buying one of them. The Play:3 although overall quite nice sounding became really flat and dull at lower volumes. I tried it in my bathroom, in my kitchen, but it only really worked at higher volumes in my large living room, until it started to struggle again above 70% of its volume. I started to get even more interested in Sonos when they announced the Playbar and the Sub, but lacking connectivity of the Playbar, as the omission of DTS decoding let me down a little bit, although I really would have loved the fact, that you could use their speakers wirelessly as rears, because I was already looking for a surround system without any wires for quite a long time. 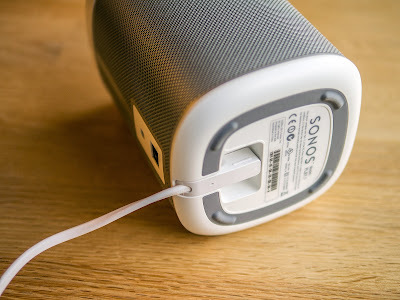 Lately Sonos announced the Play:1, their smallest and cheapest speaker yet, and I thought I would love to try this out, as most reviews are indeed quite excited about it. I highly regard the opinion and speaker measurements of Brent Butterworth that he is doing for Soundandvision, and infact he already measured the Play:1 coming to the conclusion the Play:1 having a performance that the designer of a $3,000/pair speaker could be proud of. His frequency response graph of the Play:1 shows indeed that the speaker has a relatively flat frequency response curve in a window between 100Hz and 20kHz with a slight downwards tilt towards treble, which enhances the psycho-acoustic effect of a speaker sounding fuller if treble is subdued a little bit. Some speaker engineers don't respect this simple principle and make speakers with harsh treble but hardly any bass at all (like the JBL Flip for example) which tends to sound overall rather tinny because the high frequency output is too dominant and not in balance with the rest. I was curious how the the Play:1 really sounded and if it could output a healthy amount of bass despite its small size. In fact the Play:1 is not that small, the volume measures about 2 liter, which would make it more than 4 times bigger than the Bose Soundlink Mini and still about 40% larger than the bigger Soundlink II. I have no bias towards Bose at all, I just really like my Bose Soundlink Mini that much, that I sometimes even prefer using it at home over my main speakers. It sounds incredibly rich and full and played at lower volumes you would never have the impression of listening to a speaker not larger than a power brick of a notebook. So far the Soundlink Mini was able to cause the biggest wow-effect of any speakers I have tried yet. 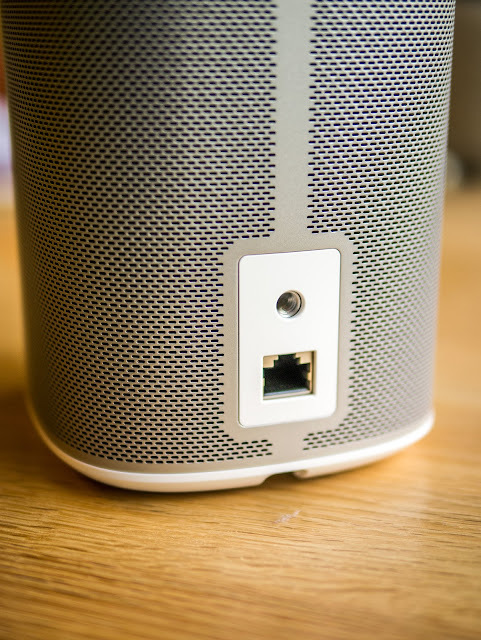 Although the Soundlink Mini is rather meant as a portable speaker on the go it sounds so nice that I am sure many will use it mostly at home as well. I asked myself if the Play:1 will outperform the Mini by a large margin or if the Soundlink Mini despite all the Bose bashing could even keep up. Although both are compeltely different types of speakers, both go for around 200$ or 200€ so a sound comparison could be hopefully quite interesting for others too. The Play:1 is offered together with the Bridge for 199,- until the end of 2013, so I ordered one to have a listen and prepare some audio comparisons. I don't want to elaborate on the Sonos system as a whole, as there is enough information to be found online. I really like the system as it doesn't interfere with any existing wireless network and seems much more stable than Airplay for example. I owned or had several different Airplay-speakers for testing and nearly all showed a strange behaviour, like sometimes remaining muted during streaming, or producing dropouts, many even renamed themselves repeatedly (the Libratone Zipp did, as my Philips Soundsphere still does it). The Sonos system just works, and the apps to control the system are among the best I have tested, especially the one for the iPad which has a generous layout compared to the one for the iPhone, where you have to jump back and forth more often. If there is one quirk then the 65000 song limit which Sonos can only index. If you have more music, many tracks will be missing and will not be listed within Sonos. This can indeed become a problem for people with lots of music. There are workarounds, but the limit still remains even with the newest Play:1. As each Sonos Player has the whole music-index saved for quick access, the limit probably comes due to limited built in memory, that never was addressed by Sonos, because of backwards-compatibilty for the older Play:5 speakers (or Zoneplayers how they were called back then). At a push you can always use any Sonos Speaker as DLNA renderer, which can be accessed by many media servers. Another Sonos-issue often criticised is the lack of any standby-mode. 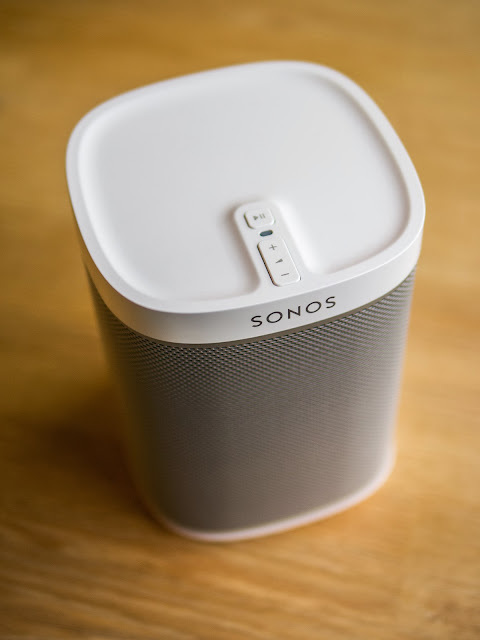 Unfortuntaely Sonos didn't change anything with the Play:1 so it is still the same, the speaker is always on and needs about 4-5 Watts whole the time, even when not used. There is no power-button either, so you have to pull the plug, if you really want to save energy. Here I rather want to concentrate on the Play:1 and its sound. The Play:1 is available in white and black, i went for white because of our white furniture at home. I really like the simple and clean design of the Play:1. I prefer it much more over the large and dull looking Play:5 front. The speaker has a nice heft to it and you really can feel the built quality. On top there are only the volume buttons and a play/pause button. On the back you can find an ethernet port as well as a thread for wall-mounting. The power cord is plugged into the bottom part of the speaker. 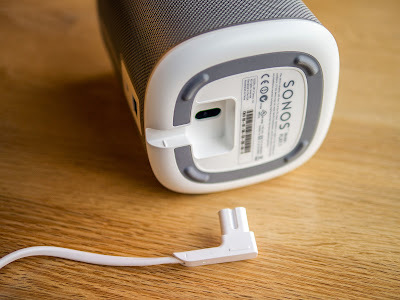 Although it is a standard plug this will only work with the supplied cord, as the special plug is designed to remain flat with the speaker's base. If you want a shorter cord or a longer one, you will be probably out of luck. It is nice though that there is no need for an external power-supply, there is just the speaker and the power cord, very clean and elegant. I have no direct comparison to the Play:3, but from memory think to remember how it sounds because the Play:1 sounds remarkably similar. It has that typical Sonos sound signature, but it also has a big advantage over its bigger brother, because it manages to sound better at lower volumes than the Play:3. Not sure if this is due to a better tuned DSP processing, or if the passive radiator of the Play:3 was to blame, but the Play:1 has a fuller sound even at lower volumes. But it is still far from perfect, as the sound loses at the very first volume steps. I was surprised how good the Play:1 sounded when turned up a little bit, but I am not sure what surprised me more, the sound of the Play:1 or how good the small Soundlink Mini managed to keep up as at lowest levels it even sounded more powerful and more concincing than the Play:1, without any kitchen-radio effect which is quite respectable regarding its small size. You might ask why I always dwell on low volume quality. But I regard this as quite important for speakers to sound convincing even at low levels. Imagine you listen to a song that you like much and you turn it up in order to get this particular drive and feel from where the song starts to sound enjoying, but then your wife comes and tells you it is too loud and asks you to turn it down. Of course you obey, but then the song loses all its power and starts sounding dull and boring. Not so with the Soundlink Mini. You can have it at its lowest level and still hear the power of the lowest frequencies. I guess Bose dynamically adjusts the sound according to the Fletcher-Munson loudness contours thus pushing low frequencies at low volumes more in order to make them better audible, because they would otherwise get lost due to the human hearing physiology. With the Soundlink Mini Bose also seems to adjust high frequencies a little bit, something they didn't do with the bigger Soundlink, which started to sound very boomy at lowest levels. Sonos also has a "loudness" setting for all of their speakers, available from the app. But to me it rather sounds like a global bass-boost. It doesn't really seem to affect the sound dynamically, that's why the Play:1 doesn't sound that convincing for low background listening, although more than the Play:3, which really sounded flat and tinny until you cranked it above 30%. At low levels The Play:1 could be brought to a similar powerful sound like the Soundlink Mini by adjusting the bass-slider some notches up within the app's EQ. This way the Play:1 had an overall cleaner but also deeper bass, while sounding a bit more dull than the Soundlink Mini, the Soundlink Mini having a hump in the upper mids, which makes it sound clearer despite having less treble definition in reality. The Play:1 has a more refined sound, especially upper treble sounds clearer and smoother without any harshness. It starts to really shine at higher levels and leaves the Soundlink Mini behind but not by that far, except when the Mini really reaches its limits above 70-80% by starting to compress dynamics and dialing back the bass in order not to distort. Up from then the Play:1 really sounds big and heavy rather comparable to the bigger Bose Sounddock than to a similar sized Radio like the Tivoli PAL. If you think that the Tivoli costs about the same, but sounds like a,... well, small radio, it is quite impressive what Sonos managed to achieve, something that the so called "audio-legend" Henry Kloss didn't. Designwise the Play:1 reminds me a bit of the former Nokia Play360, but the Nokia doesn't even come close soundwise. Even the similar but newer JBL/Nokia Playup which was redesigned and acoustically improved by JBL sounds rather toyish. 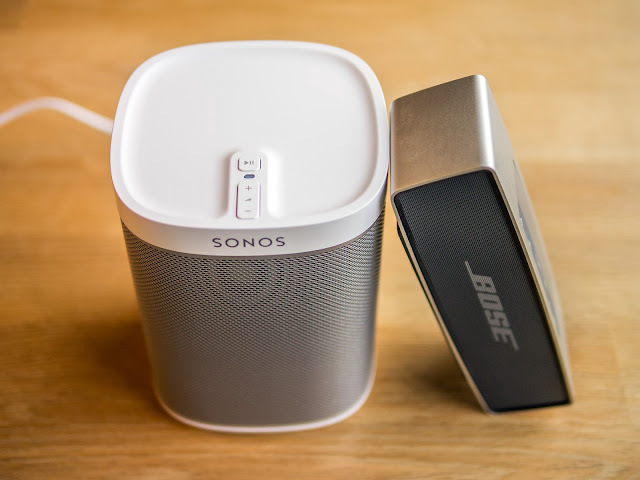 In the following video I tried to compare the Sonos Play:1 with the Soundlink Mini. The Play:1 was at about 50% of its volume, where it already sounds perfect, the Soundlink Mini played at about 60%, where bassheavy songs can sometimes already cause a bit of distortion. You can even notice some hints of distortion with this example. Although the Play:1 sounds overall cleaner and more refinded, the Soundlink Mini manages to keep up. If you consider that this is a palm-sized speaker that you can carry around with you everywhere it is even more impressive. Sonos is said to employ some former Velodyne and Boston Acoustics guys, which probably is the reason why their speakers are built with some real acoustic background, in contrast to many companies like Jawbone or Libratone which don't have any particular history in speaker design. 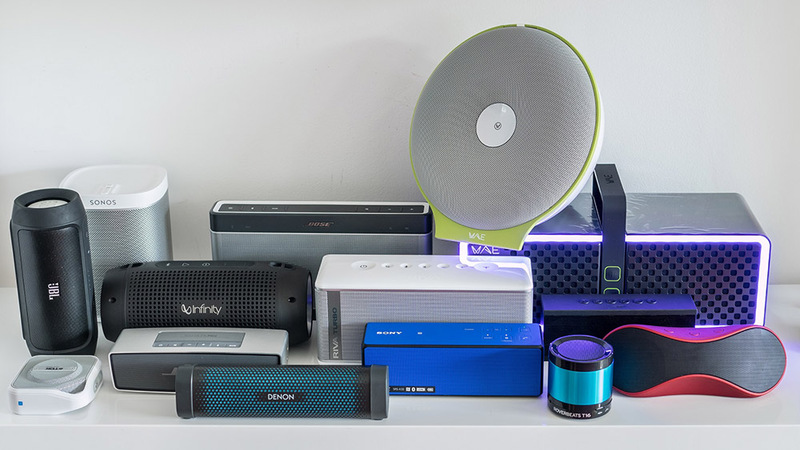 The Play:1 outperforms many bigger and more expensive speakers like the BIG Jambox for example, which sounds hollow and tinny in comparison. I would even claim that the highly regarded Libratone Zipp doesn't match the Play:1. The Play:1 has a notably wide soundfield. As the measurings from Brent Butterworth already suggested, the Play:1 is not that critical in placement. Although you shouldn't face it completely backwards, you can put it anywhere in the room and walk around, while still getting a nicely balanced sound. The Soundlink Mini can't match and has a strong treble rolloff when listened off-axis. I also prefer the Play:1 over the Harman Kardon Onyx at up to medium levels, as the Onyx sounds quite mid-focused and harsh, while the Play:1 remains quite coherent, it is only at higher levels, where the Onyx starts having a more powerful bass, while the Play:1 dials bass back in order not to distort. I would say the Play:1 sounds best at half volume, if there is lots of bass in the music it will start to dial bass back from about 60-70%, but I didn't encounter any distortion so far. Even very bassheavy mixes didn't distort at top-volume, but you could notice how bass was minimized then, without any of the impact when listened at medium levels. Especially kick-drums suffer from loss of dynamics when listened at highest levels. You won't even notice that you are listening to a mono source, the Soundlink Mini despite having 2 separate drivers for left/recht channel sounds equally mono, except if you press your face against it. But 2 Play:1 should really be able to output a serious stereo sound. I already tried 2 Play:3 which outperformed one single Play:3 by a large margin. I don't even think of combining 2 Play:1 together with the Sonos Sub, to really have a grown up system, but unfortunately with a grown up price too. 2 Play:1 would cost around 400$ which is more or less the price for the new Bose Soundtouch 20, but I am sure the Play:1 duo would leave the single Soundtouch 20 in the dust soundwise. Not to mention that with Bose's system you cannot even sync 2 Soundtouch speakers as a stereo system. I have been doing some research on a new speaker for my apartment and your reviews have been very helpful. However, although I do not want something very large, portability is not the highest priority to me since I will only be moving the speaker to different rooms in my apartment and possibly the terrace. When it comes to the more portable speakers, it seems that your top choices would be your Soundlink Mini and now the SRS-X3. 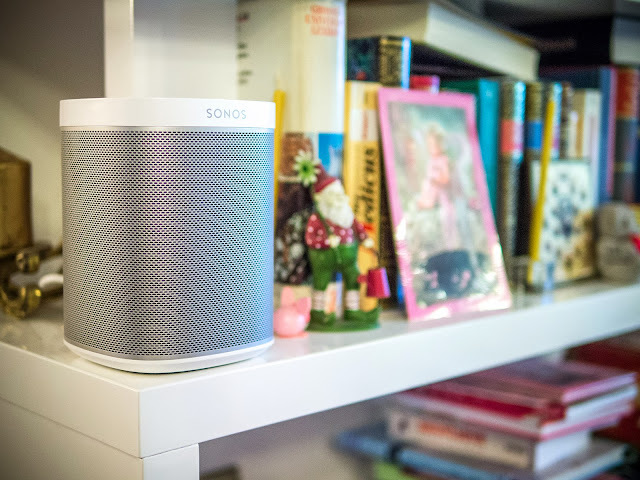 Forgive me if you have already answered this somewhere else in the comments, but I was wondering: If you had to pick a speaker for your living room (like this Sonos or the SoundDock) that did not need to be so small, what would your top choices be? This Sonos is very intriguing but it concerns me that you say it does not get very loud overall. thanks again for a insightful review. Just one questions: Where do you place your Play:1 to achieve the best sound? In a corner? How far should it be from the wall for best bass resonance? Keep this great blog going! sorry for the late reply, some comments get missed somehow. I found the Play:1 to be not very critical for placement. It has no bass-port not back passive radiator and I even found it to sound good in a room's corner. Since they released true play, they sound even better! Plus a stereo pair sounds insane. My big gripe is the lack of an Aux port. Yes two Play 1's in a stereo pair are an excellent option. I personally think they sound much better than a single PLay 5 which, since getting the 1's , sounds comparitively muddy and boomy and is certainly more sensitive to placement. The stereo pair really opens up the sound and delivers greater volume and bass. I've noticed lots of shops and restaurants using these now which says something when it can provide music to a room of people talking. SONOS Player 1 is a great product! Normally you can buy SONOS when it has sales!